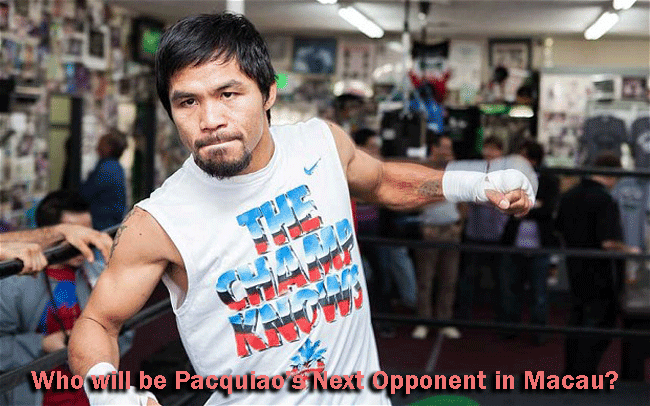 Home Boxing Entertainment Manny Pacquiao News Sports Who will be Pacquiao’s Next Opponent in Macau? Who will be Pacquiao’s Next Opponent in Macau? This week will mark the career of Manny Pacquiao as a legendary Filipino boxer, as Robert “Bob” Arum, CEO of Top Rank, Las Vegas and Mike Koncz, Manny’s business consultant talks about who will be his next opponent in November’s fight in Macau. Koncz and Arum will meet in Macau to talk about the next big fight of Manny in November. Knocz headed China in Wednesday for the agenda of meeting Arum the next day as a prelude meeting regarding the mysterious opponent of Manny in the upcoming fight. It would be all preliminaries and nothing was done yet commented Koncz in a telephone conversation with a writer. He added that they would be discussing who among the names being considered had a chance but as he said nothing more would be decided. Mexican Legend Juan Manuel Marquez, Pacquiao’s adversary, was refused to consider by Koncz. Though he topped the list, as projected by several sectors as he victoriously won several fights with Mike Alvarado and Timothy Bradley, still he was under consideration if he could be Pacquiao’s next fearsome opponent. Koncz stressed that these things were mere speculations and everything was still hanging in the air as Marquez showed no interest in a fifth fight with Pacquiao. Marquez, before his fight with Alvarado said that he was willing to fight with Pacquiao but now it is nothing but contradicting statements. Mexican’s side expressed their opposition knowing that they have no match with Manny. Pacquiao made no specific will to decide of who he wanted to face next but depended only in the decision of his promoter. He quoted that he would fight anybody, anytime at any place as his promoter wished. Even his wife Jinkee supported his statements telling that they chose nobody as long as they could make their fans happy. They even considered personalities like Ruslan Provodnikov, Shawn Porter, Amir Khan and Keith Thurman but haven’t decided yet. This story appeared on PhilBoxing.